With an objective to develop the superior cultivars of chickpea for drought tolerance and with enhanced resistance to Helicoverpa, concerted efforts have been made by Objective 4 Team of Tropical Legume I (TL-I ) in Phase I. Screening of the germplasm has provided drought tolerant and Helicoverpa resistant lines. Significant genomic tools like SSRs (simple sequence repeats), SNPs (single nucleotide polymorphisms) and DArT (Diversity Array Technologies). arrays have been developed. Several of these have been documented in (Theoretical and Applied Genetics (2010) 120, 1415-1441; Gujaria etal (2011) 122, 1577-1589; PLoS ONE (2011) 6, e27275). A few putative QTLs have been identified for resistance to Helicoverpa and drought tolerance. Genomic region harbouring drought tolerance QTLs introgressed into three elite Indian cultivars ICCV 92318, ICCV 92311 and ICCV 93954. Marker assisted recurrent selection initiated for accumulating drought tolerance alleles. In collaboration with NRCPB and IARI.The main aim of this project was, to identify candidate genes (or expressed sequence tags) and molecular markers (SSR, SNP) associated drought tolerance. The project has good collaboartion with NRCPB and IARI. A comprehenisve set of 20,162 Sanger ESTs was developed from drought and salinity challenged tissues (BMC Genomics (2009) 10, 523). In collaboartion with Generation Challenge Program, a transcriptome assembly based on 454 transcript reads were developed (Plant Biotechnology Journal (2011) 9, 922-931;). In collaboartion with Generation Challenge Programme, about 2900 differentially expressed genes were identified following Illumina 1G sequencing approach (Plant Biotechnology Journal (2012) 10, 716-732). Selected genes were validated through quantitative real time PCR (qRT-PCR). In collaboartion with TLI-Phase I proposal, a genetic map was developed on the intra-specific mapping population ICC 4958 × ICC 1882. In collaboartion with TLI-Phase I proposal, a genomic region containing several QTLs for root traits wad identified. A TILLING population comprising of 5236 lines from ICC 4958 genotype was developed. 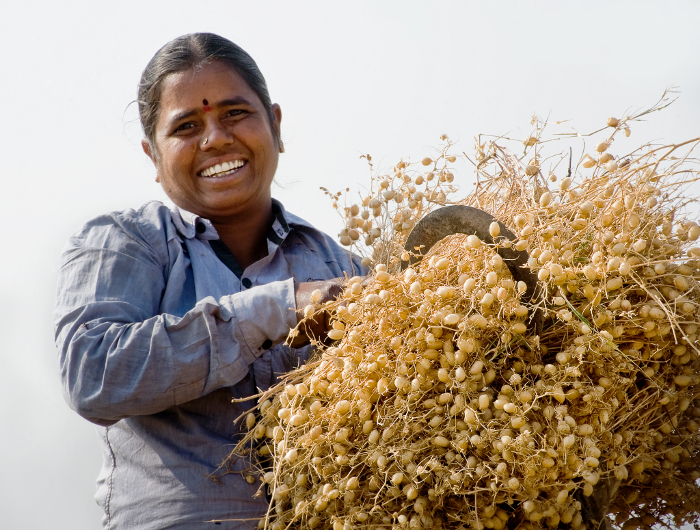 ICRISAT in collaboration with NIPGR, developed functional markers and the first transcript map for chickpea. Novel set of gene-based molecular markers (GMMs) including 143 CGMMs, 87 CISRs and 51 ICCeMs were developed. By using above developed molecular markers along with additional set of genic markers, a genetic map comprising a total of 300 loci including 126 GMM loci with a coverage of 766.56 cM and an average inter-marker distance of 2.55 cM was developed (Theoretical and Applied Genetics (2011) 122, 1577-1589). 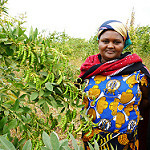 To enable genomics-assisted breeding in pigeonpea, the pigeonpea genomics initiative (PGI) was initiated in late 2006, as a result of the PGI, the last 3 years have witnessed significant progress in development of both genetic as well as genomic resources in this crop through effective collaborations and coordination of genomics activities across several institutes and countries. Twenty five mapping populations segregating for a number of biotic and abiotic stresses have been developed/ are under development (Molecular Breeding (2010) 26, 393-408). Bacterial artificial chromosome (BAC) library with 11X-genome coverage comprising of 69,120 clones have been developed and 50,000 clones were end sequenced to generate 87,590 BAC-end sequences (BESs). A set of 3072 SSRs were developed from BES. About 10,000 expressed sequence tags (ESTs) from Sanger sequencing and ca. 2 million short ESTs by 454/FLX sequencing have been generated (DNA Research (2011) 18, 153–164). In order to enhance the genomic resources for pigeonpea, the study was designed to large scale development of SSR markers from BAC-end sequences (BESs) and their subsequent use for genetic mapping and hybridity testing in pigeonpea. Two BAC libraries were developed from pigeonpea cultivar “Asha”, based on partial digestion with HindIII and BamHI restriction enzymes. A set of 88,860 BAC (bacterial artificial chromosomes)-end sequences (BESs) were generated from two BAC libraries by using HindIII (34,560 clones) and BamHI (34,560 clones) restriction enzymes. BESs were searched for microsatellites or simple sequence repeats (SSRs) and a total of 18,149 SSRs were identified, from which a set of 6,212 SSRs were selected for downstream analysis. A total of 3,072 SSRs were successfully used for primer pairs synthesis and tested for polymorphism on a set of 22 parental genotypes of 13 mapping populations segregating for traits of interest. In total, 842 polymorphic SSRs were identified. Sterility mosaic disease (SMD), known as the “green plague of pigeonpea” and caused by Pigeonpea Sterility Mosaic Virus (PPSMV), is one of the major biotic factor which leads to heavy yield losses. The project aims at identification of the genomic segments related to SMD resistance. Two F2populations i.e. ICP 8863 × ICPL 20097 and TTB 7 × ICP 7035 were developed and F2:3 families were phenotyped by using leaf stapling method for resistance to SMD. Intra-specific genetic maps comprising of 11 linkage groups and 120 and 78 SSR loci were developed for ICP 8863 × ICPL 20097 and TTB 7 × ICP 7035 populations, respectively. The main goal of this project is to identify the potential polymorphic markers for drought tolerance in pigeonpea using Affymetrix Genome Arrays of soybean (Glycine max), on cRNA of six parental genotypes of three mapping populations of pigeonpea segregating for agronomic traits like drought tolerance and pod borer (Helicoverpa armigiera) resistance. Expression data were generated by hybridizing pigeonpea cRNA to the soybean genome array. A total of 5,692 potential SFPs were identified by using robustified projection pursuit (RPP) on 15 pair-wise comparisons for six parental lines. Based on good quality sequence data for 75 genes, true positives were found for 37.73% predicted SFPs for ICPL 151 × ICPL 87, 40% for ICPL 8755 × ICPL 227 and 86.11% for ICP 28 × ICPW 94 parental combinations. A set of 397 candidate genes that may have association with drought tolerance identified based on gene ontologies (Functional Integrative Genomics (2011) 11, 651-657). To accelerate the application of genomics to improve yield and quality draft genome sequence has been generated. Next generation sequencing (Illumina) was used to generate the raw sequence reads that, along with Sanger-based BAC end sequences and a genetic map, was assembled into scaffolds. Genome annotation and downstream analysis were conducted by using standard bioinformatics tools. By using Next generation sequencing a total of 237.2 Gb of sequence were generated that, along with Sanger-based BAC end sequences and a genetic map, was assembled into scaffolds representing 72.7% (605.78 Mb) of the 833.07 Mb pigeonpea genome (Nature Biotechnology (2011 30, 83-89). Genome analysis predicted 48,680 genes for pigeonpea and also showed the potential role of some gene families during evolution/domestication, e.g. drought tolerance related genes. Although a few segmental duplication events were found, recent genome-wide duplication events, such as seen in soybean, were not observed. The large scale sequence information generated using NGS technologies utilized for generation of molecular markers (SSR, SNPs) and construction of genetic maps using the genomic resources developed. A total of 494,353 short transcript reads (STRs) generated from normalized cDNA pool prepared from 31 tissues employing Roche/FLX 454 sequencing. A total of 150.8 million Illumina sequence tags were generated from 10 pigeonpea genotypes. For identification of SNPs, tags for two genotypes of a given mapping population were aligned with 127,754 TAs (DNA Research (2011) 18, 153–164), (Molecular Plant (2012) 5, 1020-1028). The number of SNPs in an individual cross ranged from 704 to 6,263. In total, 12,141 SNPs were identified across these genotypes. In terms of developing the marker platforms, CAPS markers could not be validated at a good rated. As a result, a total of 1,834 SNPs were attempted for KASPar assays and successful assays were developed for 1,616 SNPs and tested on a set of 94 genotypes. In addition, four genetic maps were developed based on SSR markers and by using these maps, in addition to two earlier maps, a consensus genetic linkage map was developed that includes a total of 339 SSR marker loci (DNA Res (2012) doi: 10.1093/dnares/dss025). The project aimed at developing novel set of markers, construction of several genetic maps and identification of genes/QTL associated with resistance to foliar diseases (rust and late leaf spot) and drought tolerance related traits. 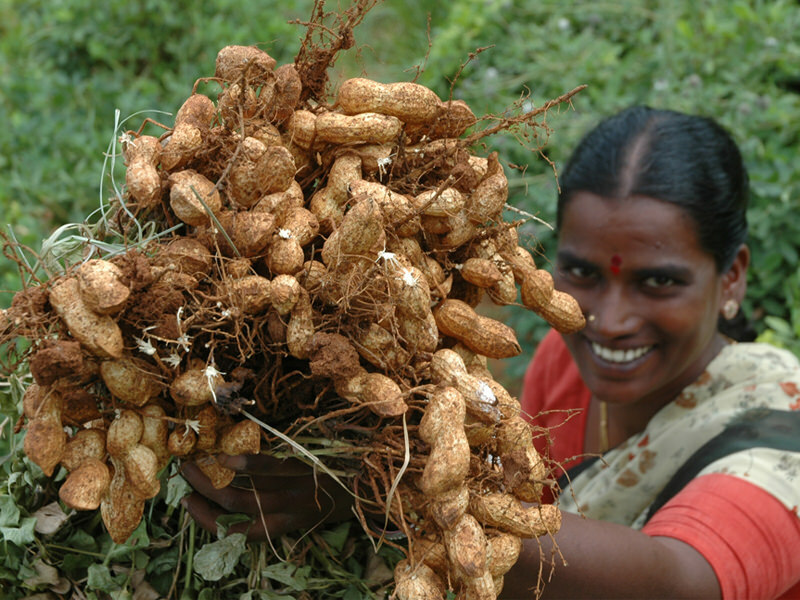 For the first time, SSR based linkage map was developed for cultivated groundnut using a RIL population derived from the cross between cultivated genotypes (TAG 24 × ICGV 86031) (AABB genome). (Theoretical and Applied Genetics (2009) 118, 729-739). Four populations (RIL-2: ICGS 76 × CSMG 84-1, RIL-3: ICGS 44 × ICGS 76, RIL-4: TAG 24 × GPBD 4, RIL-5: TG 26 × GPBD 4) were used to construct four more new individual genetic linkage maps ranging from 82 (RIL-3) to 188 (RIL-4) marker loci. Total map length ranged from 831.4 (RIL-3) to 2208.0 cM (RIL-2). Two consensus genetic maps were prepared for drought tolerance based on three RILs (RIL 1-3) with 293 SSR loci (2,840.8 cM) and for foliar diseases based on two RILs with 225 SSR loci (1152.9 cM), respectively. Extensive phenotyping and comprehensive QTL analysis in all the five populations detected a total of 153 main effect QTLs (M-QTLs) and 25 epistatic QTLs (E-QTLs) for drought tolerance related traits while 43 QTLs for foliar diseases (LLS and rust). Sixteen key genomic regions were selected on the basis of QTLs identified for their expected role towards drought adaptation. Similarly, in case of foliar diseases, a major QTL each for LLS (62.34% PVE) and rust (82.96% PVE) resistive were identified. (Theoretical and Applied Genetics (2009) 118, 729-739); Theoretical and Applied Genetics (2011) 122, 1119-1132; Field Crops Research (2011) 122, 49-59; Molecular Breeding (2012) 30, 757-772). A total of 244 SSR markers have been developed at ICRISAT and accessed primer sequence information for 4485 SSR markers from different sources. All the SSRs are being used to screen parental genotypes of different mapping populations to identify polymorphic markers between different parental crosses. Screening led to identification of 199 highly informative SSR markers with PIC >0.50 (Plant Breed (2012) 131, 139-147). Microsatellite enriched (CA, GA, CAA and AGA repeats) gDNA library was constructed from the pearl millet genotype “Tift 23D2B1-P5”. Among different classes of SSRs, di-nucleotide repeat motifs were found to be the most abundant (830; 36.5%) followed by compound (767; 32.4%), mono-(370; 16.3%) and tri-nucleotide SSRs (305; 13.4%). A total of 454 primer pairs were designed of which 226 produced scorable amplicons and 69 markers were found polymorphic across of the panel of 22 pearl millet inbred lines studied. Further a set of 45 markers polymorphic were genotyped on the RIL population ICMB 841-P3 × 863B-P2, of a set of 22 markers could be integrated on to the genetic map.